Monday: The Cheat Narrows is a great class 2-3 river that allows me to quickly assess everyone’s ability. 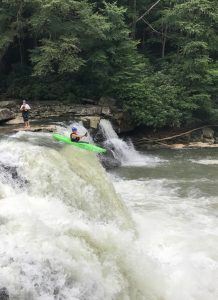 Everyone did well and since we were close to the Big Sandy river I wanted to take them on a very forgiving 18′ waterfall. To do this would mean we would have to paddle down the first mile and half of the Lower Big Sandy to get there and then hike all the way out with our kayaks. I do like to push kids and toughen them up, but I also didn’t want to break them on the first day! I will just say that since your kids are home, then they survived. We ate a hearty Mexican meal and we all slept in hammocks under a pavilion will commandeered for the week. I think the hike out helped them sleep hard. 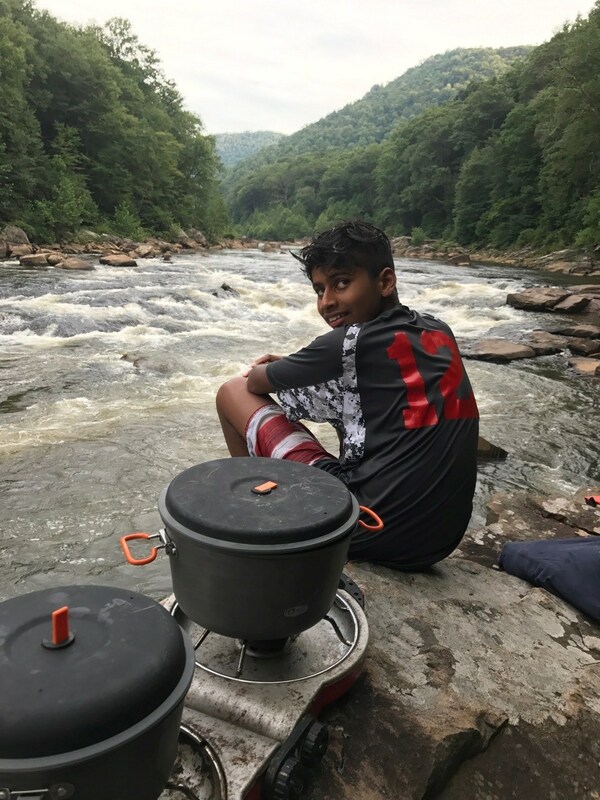 Tuesday: All night I thought the next day we would go to the Lower Yough river and then come back to the cheat as a progressive step in ability and challenge but a small rain on Monday night allowed the Lower Big Sandy to still have enough flow on Tuesday. 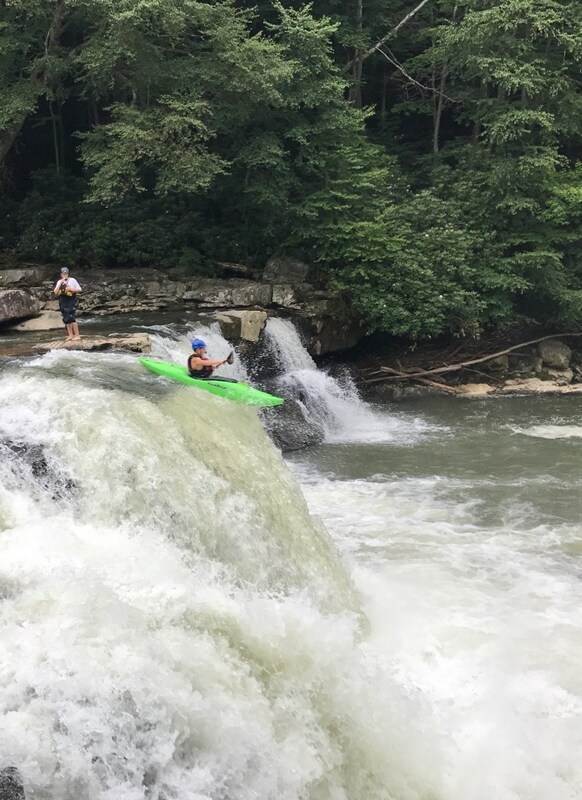 I had never take a group down the Lower Big Sandy. It is steep and technical. Maybe on a Friday I would think about it, but the chances of enough water were not looking good for Friday. 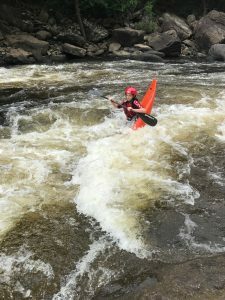 The Yough was the easy safe bet but I thought, this is high adventure! So we went to LBS! I think. We carried and snuck some of the harder rapids. 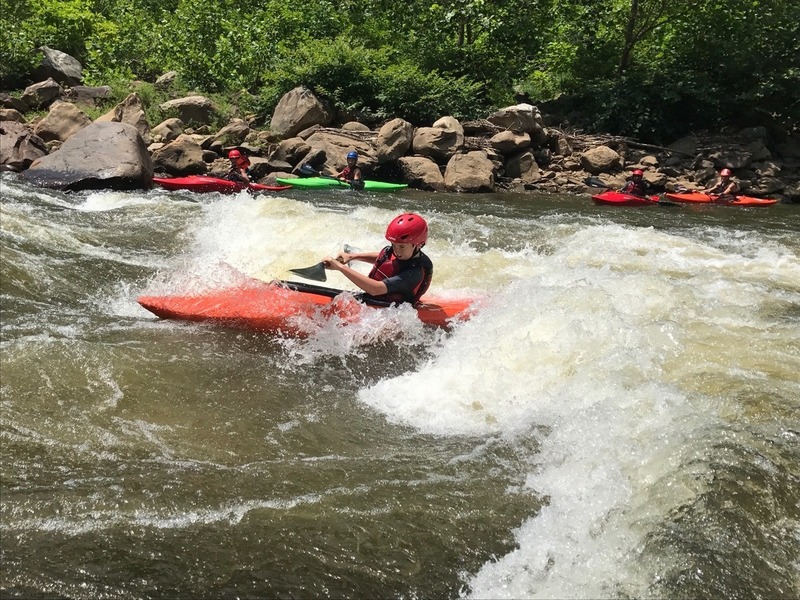 I’m glad the kids could experience a harder river and realize they could do it! Congrats to Johnny and Mitchell for running Big Splat. Wednesday: the Cheat Canyon was way low and dropping. 11 miles at low water makes a long day. I have in the past camped out along the river so we can take out time and play along the way. I brought a raft and we loaded just the bare minimum to head out on a 2 day trip. At low water the Cheat has nice holes to surf. The stars and moon were amazing and we went to bed thinking we were safe from rain. Thursday: I woke up at 3:33am to dark clouds and winds picking up. I hastily made shelter but the rain never came. It must of rained somewhere because at 6:00am I noticed a change to the sound of the rapid. I looked at our kayaks and realized the water had risen a foot! One kayak was about to slip away and a blue kayak was missing. I sent Johnny and Mitchell downriver and a seek and find mission while the rest of us broke camp. The Cheat was indeed a higher and different river. That night we went to CiCis pizza and saw Spider-Man. Not to bad but if you’ve seen one, you’ve seen them all, same plot different costumes lol. 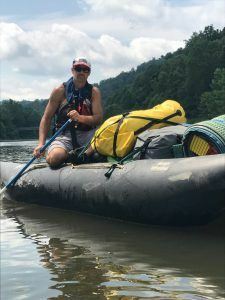 Friday: It poured overnight and the plan was to spend last day on Yough river, but… when the Cheat is high, it’s an entirely different river then before. We voted on the cheat, and boy did we make the right choice. Ask your boys about the mist, the monsoon, the big waves and holes, it was my favorite day of kayaking in a long time. I really feel like we accomplished a lot this past week. Each kid had moments of doubt and of greatness. I thoroughly enjoyed spending a week with these guys and hope they continue to push and believe in themselves both on and off the river.